Seven-time Supercars Champion Jamie Whincup has made it ten wins in ten years in North Queensland, by claiming victory in today’s opening race of the 2018 Watpac Townsville 400. 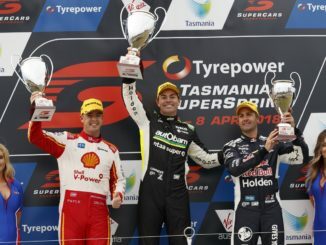 It was Whincup’s third race win of the year, and was desperately needed to keep the defending Virgin Australia Supercars Champion within reach of current points leader, Scott McLaughlin who finished third today. Whincup’s Red Bull Holden teammate, Shane van Gisbergen split the pair to finish second, while just a day after announcing 2018 will be his final year as a full-time driver, Craig Lowndes finished fourth. Lowndes will tomorrow compete in his last Townsville with his performance today and the quick cars of the 888 outfit setting him up for a strong North Queensland finale tomorrow. Making up the top ten, Fabian Coulthard capitalised on late speed to finish fifth ahead of Mark Winterbottom, David Reynolds, Cam Waters, Will Davison and Nick Percat who rounded out the top ten. 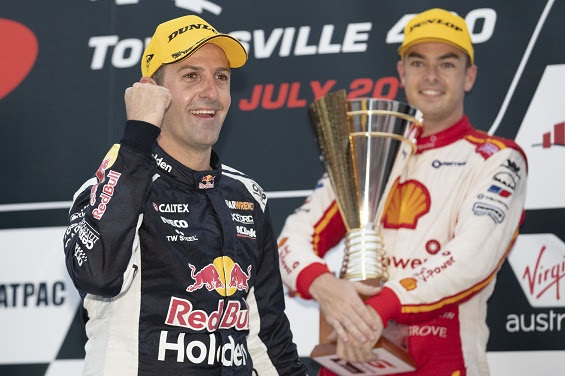 Whincup’s victory today stamped his dominance as the best-ever driver on the Townsville street circuit. He has now won exactly half of all the races held at Reid Park since 2009. It was a well needed tonic for the Champion who needs a charge to catch the leaders. “I had to remind myself I could still drive,” Whincup said post-race. “But [engineer] David Cauchi gave me an absolute rocket today, it was a lot of fun. We were able to lead from the start and a one-two for the team, I couldn’t be happier. 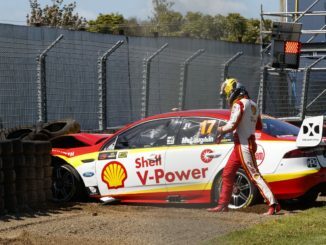 The seven-time Champion opened a huge lead over the opening 20 laps of the 200km race, before McLaughlin and van Gisbergen pitted on the 21st lap. The Red Bull Holden driver got the better of McLaughlin in pit lane and returned to the track in front, and from there McLaughlin couldn’t make up ground on the Red Bull Holden’s that held on for their first 1-2 finish of 2018. “Jamie was fast from the get-go. I got a good start and thought ‘this is good’, but he just came blistering past,” McLaughlin said. There was a final twist in the race when with just 16 laps remaining some metal debris was spotted on the track from an earlier incident, which brought out the first safety car of the weekend. It brought Whincup back to the pack and when racing restarted, van Gisbergen made a late dash to steal the race win, but Whincup held on to record his 111th career race win. McLaughlin now leads the championship by 152 points from van Gisbergen, Reynolds remains third while Whincup moves up into fourth, 412 points behind McLaughlin and Lowndes rounds out the top five. 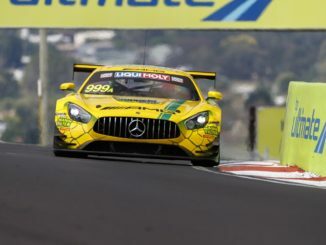 There will be another round of qualifying tomorrow morning at 11:30am before a Top Ten Shootout and the second and final 200km race of the weekend tomorrow afternoon which begins at 4:05pm AEST.